If there’s one thing that so many of us have in common it’s the ordeal of eating turkey and ham for days on end until we finally are so sick of it we are ready to say goodbye to those foods until next year. Or Christmas. I’ll be hosting a Twitter chat from 10:30 AM to 11:00 AM PT on Wednesday, November 21. You can tweet your questions to me @pikko with the hashtag #AsianTGiving. Without further ado, here are five ideas for turning your Thanksgiving leftovers into bentos. 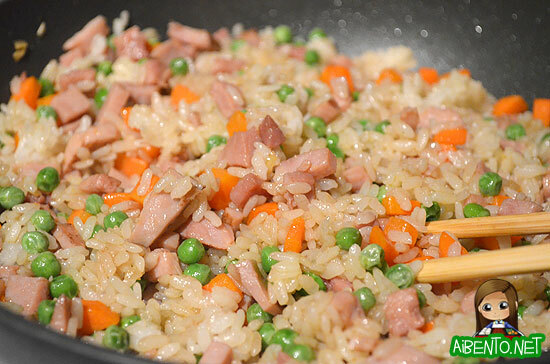 One great way to use up your ham leftovers is to chop it up and turn it into fried rice, which is yummy, tasty, and fast. Pour soy sauce on to taste, stirring the rice to incorporate all the flavors. Add a bit of salt and pepper. Keep tasting until it’s how you want it. 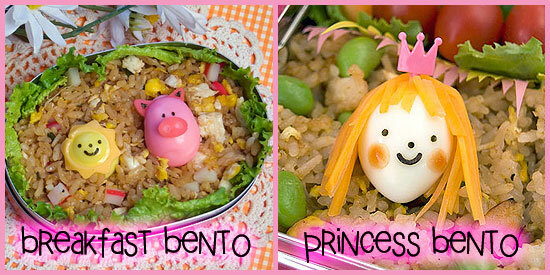 For bentos, fried rice makes a lovely palette for charaben, such as can be seen in my Charaben for Breakfast Bento and Princess and the Edamame Bento. Even though we have traditional roast turkey every year, my mom got me hooked on pulled turkey years ago, so now every year I buy an extra turkey and slow cook it in the oven until it’s falling apart. I give it away or freeze it and then use it for smoked turkey wraps for the next few months. As you can see, wraps are another great palette for cute figures. You can find the recipe for smoking at turkey on my Whale Friends Bento post. 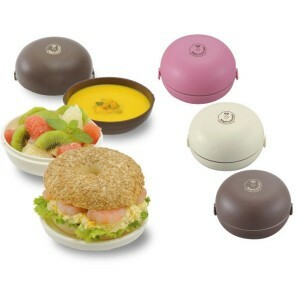 I know this one sounds weird, but with a bagel bento box, you can put together a lunch kit for a hot turkey sandwich at work. All you need to do is bring a small disposable plate with you for re-heating. Try not to pay too much attention to the food photo. I can assure you, there’s no way you can fit all that into the one box, especially since the soup bowl carries the fruits. You’d technically have to bring the soup with you in a separate container. Anyway, Deligoo Bagel Boxes, which can still be bought online at Casa Bento, can hold the pieces for a hot turkey sandwich. The bread, which should be a round bun, will rest on top of the bowl’s cover. Inside the bowl, you’d put your turkey and gravy. When you’re ready to eat, take your round bun off the cover and put the bottom on your plate. Pour out the turkey onto the bun bottom, then cover with the top bun. Pour remaining gravy onto the whole thing and microwave until warm. 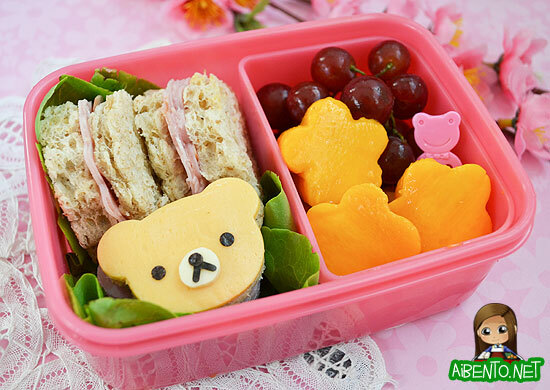 Cute sandwiches are usually made with cold cuts, but one downside of this is that your sandwiches are sometimes a little too short to put nicely into a bento. 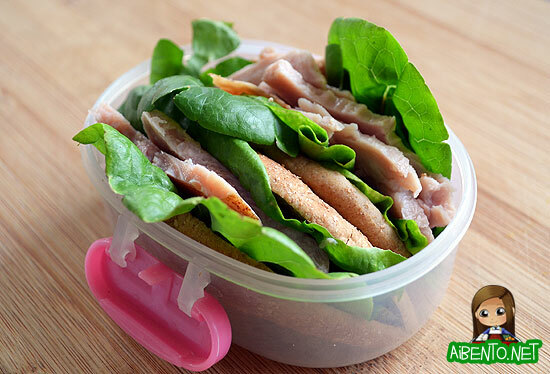 Using a thicker cut of roasted turkey would give a cute stamped sandwich more height and make it easier to arrange. Read my tutorial on how to use cute sandwich cutters. 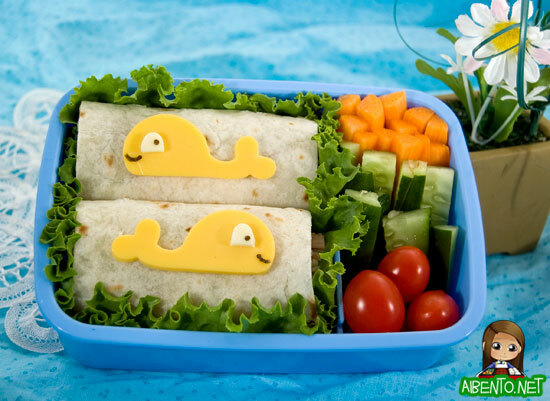 Just add mayo and cheese and it’ll be a cute little yummy sandwich! Thanksgiving food is usually always heavy, so I’m a big fan of freshening it up with lettuce and tomatoes. I used something called Honey Oat Thinwich bread for this. Split it in half and use each side for a pita. Spread with mayo, line with lettuce, tear up ham, and add sliced tomato (I didn’t have any). You could even sprinkle bacon bits into it for some added taste. I’d probably bring some ranch dressing to pour in before eating too. That’s about all I could do without cooking a Thanksgiving dinner before Thanksgiving, haha! I hope this has given you all some good ideas for putting a new spin on leftovers this week. Don’t forget to join me for the Twitter chat using the hashtag #AsianTGiving tomorrow!